The machine is designed for straightening and cutting of concrete reinforcement iron for construction, in diameter range of 3 – 6 mm. It is made of welded steel construction with central bearing, and can also receive the asymmetric load during the manual or mechanized loading of the drum. 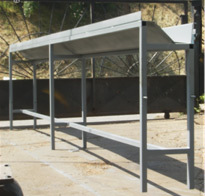 It is installed in front of the machine on 3 – 5 m, depending on the applied loading procedure. If the loading is manual, the winch should be positioned at maximal distance from the machine, and fitted directly with its support in the same level with the support of the machine. 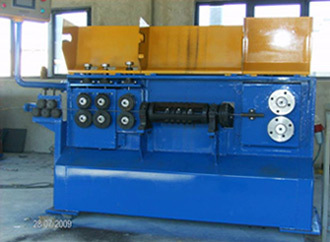 If the loading is mechanized, the winch may be moved closer to the machine, but it is necessary to be raised on higher level, so the profile unfolds as closer as possible to the flow axis of the machine. 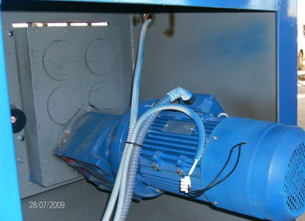 Winch is self propelled by the motor-reductor of 0.75 kW, which operation is regulated by the frequency regulator. Speed of unloading need to be adjusted with the speed of wire motion through the machine. There are several openings in the winch base, for positioning pillars for drum centering. The machine housing is robust welded construction made of 6 mm thick sheet, and the support plate is made from 15 mm sheet. On that plate are mounted all the functional parts of the machine. 2. 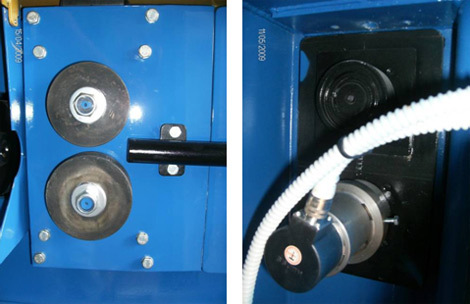 Pulling part is installed on the front part of the machine housing and is consisted of two pairs of rollers, where the first pair pulls and the second pair pushes the wire. All of the four rollers are geared among each other and propelled by the motor - reductor of 3 kW. Motor function is regulated via frequency regulator which enables speed regulation from zero to maximum value. Working speed is 40-60m/min. The gears and the shafts are fitted in the separated strong housing which is sealed and partly filled with oil, which enables smooth and stable machine function. Rollers are profiled so that the lower roller has a canal throw which the wire moves, and the upper one has a buckle which presses the wire. 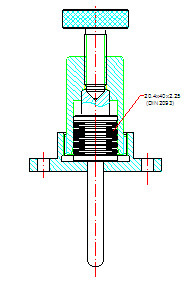 Lower pair of rollers is stable, while the upper is adjustable, which enables pulling of wire of different thickness, as well as it’s fixing that enables its movement. Fixing is achieved by the screws, over the housing in which is inserted a set of plate springs, to enable shock amortization during the passing of wire through the rollers trucks. 3. 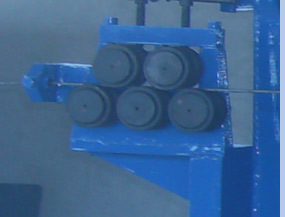 Rotational drum is designed for wire straightening. It is propelled by 3 kW motor and the rotation speed is app. 1800 r/min. In the drum are fitted 5 steel capsules positioned in their housing. Three inside capsules are removed from the drum axis to enable breakage and better lining, and inlet and outlet capsule are fitted in the axis. 4. Measurement device is consisted of one pair of rollers, lower is fixed and the upper, pressuring roller that presses the wire to avoid its slippage and achieve accurate measurement. Measuring roller is attached by the same axle with the device that send impulses to the processor, or the encoder, which transforms this impulses into millimeters, and accordingly calculates in centimeters the required profile length. The basic working principle of this measurement is based on overlapping of the previously assigned profile length and really passed length over the measuring roller. In that moment the processor gives a command for cutting, and the operation is repeating until the required quantity of peaces is produced. After that, the machine is stopping and waiting for the new program. 5. Cutting device is the last working structure in the row. The knives are placed on one pair of rollers and are facing in one point at the moment of cut. The main characteristic of the machine is that cutting functions without stopping the main motion, i.e. cutting continues along with the movement. The rollers that carry knives are propelled by the 3 kW motor via reduction unit which contains set of gears and shafts. This transmission set is enclosed in strong housing which is sealed and partly filled with oil, which enables smooth and stable machine function. Function of this motor is also regulated via frequency regulator. The device contains its own measuring system with the encoder, which regulates the rollers play, i.e. defines starting point of the knives movement, to ensure required moment of cut. Cut is performed when the required wire length is achieved. Encoder on the measuring device generates a signal that is sent to the cutting device motor. At that moment the motor starts the rollers which face in the cutting point. All of those devices that contain rotational parts are protected with the sheet shields to disable potential accidents. Micro switch disables drum movement until it cover is closed. After the cutting, armature is collected in the trough which is mounted immediately behind the main part of the machine. Its length is 4 m.
Control board with the processor is positioned on the machine and operator has easy access for entering commands. It is mounted on the rotary carrier. In the board, along with the processor, are also installed all machine controls. The board is mechanically closed and sealed, so the dust which is produced during the machine work does not affect the processor. Electro-box is fitted in the back part of the machine. 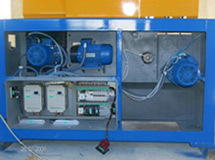 Frequency regulators for adjustment of machine operating regime are placed in this box. 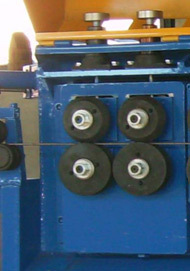 -	Pressing rollers should be adjusted to minimal pressure, that is sufficient for correct wire straightening. -	The oil level in the reductor (SAE 90) of the pulling mechanism should be controlled and replaced after 2000 - 3000 working hours. Cleaning of the machine is performed by blowing compressed air from time to time to eliminate dust and peelings that come from armature processing and wiping machine housing with cloth. 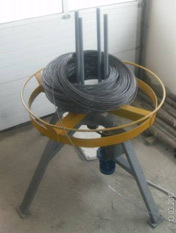 -	Start the machine only after the wire is inserted between the pulling rollers and fixed. -	Don’t start the rotating drum before the protective shield is set down. -	Perform all the adjustments when the machine is standing still. -	Mount the machine on the hard concrete surface and ground it by bolts. -	Train the operator shortly before operation.